SUNDAY TO WEDNESDAY OPEN @ 4PM. - 10PM. THURSDAY TO SATURDAY OPEN @ 4PM. - 1AM. 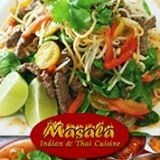 Indian & Thai cuisine in uptown Chicago.